Home » my sampler » Mod Mod Sampler Finished! I finally finished this just a moment ago and was so excited I threw it down in my yard and snapped a photo so I could post it for you. I did it as quilt-as-you-go, and found tutorials on the internet that let me finish the sashing and the binding totally by machine. It’s what a mod mod quilt deserves, don’t you think? This is the queen size, so it’s very big! My mother loved it when she saw it, so I am going to give it to her. After I wash it. Thanks Sophie for the pattern and the super fun year of mod blocks! Wonderful quilt. One that you’ll never forget. 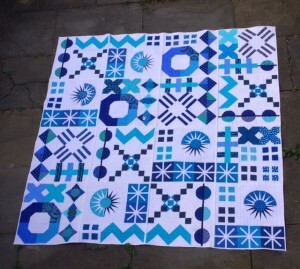 What a beautiful quilt and it’s yours from creating the blocks to the quilting. Your mom is one lucky lady! Oh my goodness! This is my very favorite one because it is all done in blues. It is just so lovely. It reminds me of those Danish blue and white china plates for some reason. You should be excited! What a lovely finish! It’s been fun to see the variety in all of the MOD Quilts. Another stunning interpretation of this quilt. I love everything about this one! It is hard to stop looking.